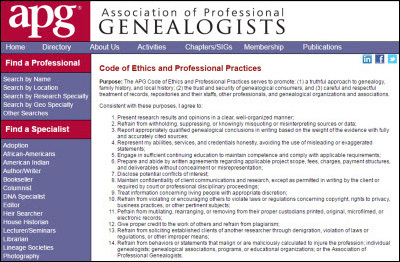 The Association of Professional Genealogists has long had a code of ethics to guide genealogical professionals and consumers through some of the murky waters of ethical issues underlying this field of ours. And it’s just been updated to clarify some elements of ethical behavior that impact the professionals and consumers alike. Where it used to have eight numbered paragraphs, the code now proceeds then through 14 numbered paragraphs. Some of the changes are purely in the way the code is presented. Breaking the concepts out into separate paragraphs gives each of them the emphasis it deserves. There are some basically new provisions, or with new emphasis, particularly when it comes to confidentiality, conflict avoidance, putting everything in writing and getting the education we all need to maintain and build our skills. It now requires that APG members “disclose potential conflicts of interest”9 — problems where the professional’s personal interests might not be the same as the interests of the consumer. It’s the first update to the code since 1991 — and a good strong step forward. Hats off to APG for taking the ethical lead.